Ian Holloway made three changes for the trip to Fratton Park, one of which was fairly easily anticipated – Stephen Crainey replaced Matt Hill at left-back, a change that should perhaps have been made one game earlier against Cardiff. Two more unexpected changes though came in the form of Tom Ince and Matt Phillips, who started in place of Brett Ormerod and Billy Clarke who were both left out of the matchday squad altogether. It was a day of contrasting fortunes for the two wide men – Ince showed his ability and has made a case for earning a run in the side, while it was a day to forget for Matt Phillips whose start to the season has been disappointing. 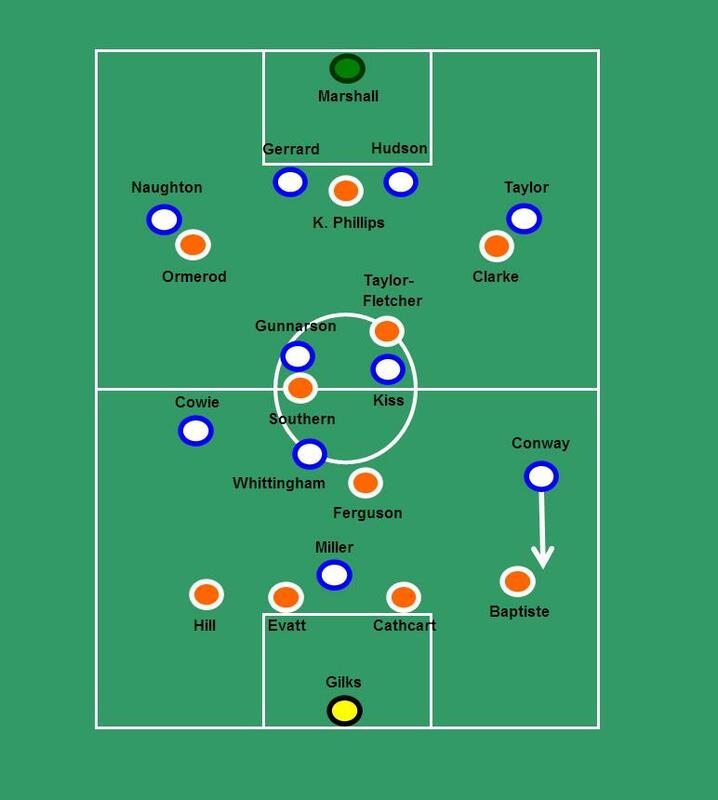 An interesting point to note is how Holloway had set up his wingers, with the wide men playing in an inverted position for much of the game. In some instances, switching wingers to their unnatural flanks can be a clever ploy to confuse and deceive the opposition, but playing on their natural side was very much the exception rather than the rule at the weekend, including a full 25 minute spell at the start of the game with Matt Phillips on the left, and Ince on the right. Where Ince looked comfortable with the ball at his feet, regardless which side of the pitch he found himself on, the story with Matt Phillips was slightly different. Once again Matt Phillips looked a shadow of the player he promised to be in stages last season, lacking any sort of confidence – the poor England U20 World Cup campaign seemingly still affecting him. There is a case to be made that the former Wycombe man is at his best when running with the ball from deep, and that this is much more difficult for him on the left when he always has to be thinking about checking back at some point. Conversely, his best work did come from the left, but in an off-the-ball capacity making a run for his two clear chances. Upon collecting the ball however, he looked comfortable in neither situation, when a player at this level should be converting at least one of those two chances. 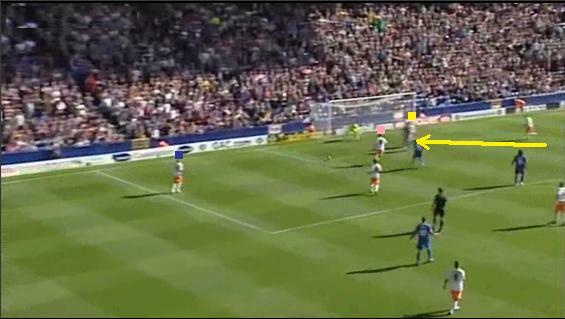 It’s hard to know where Holloway goes with Matt Phillips at the moment. To get the best out of him he surely needs to play him on the right in his natural position, but it’s currently hard to justify giving Matt Phillips an extended run in the side in the hope that it may play him into form. As for Ince, it was a first league start filled with promise. Pacy, confident and with no shortage of skill, Ince looked everything Phillips isn’t just now. An end product wasn’t visible on Saturday – a three-on-two situation in the second half saw Ince fail to take advantage of the superior numbers and lose the ball – but he looked as likely as any Blackpool player to make the breakthrough. Right now, Tom Ince appears to be ‘Pool’s best option on the left of a front three, and I’m sure we’ll see more of him in the coming weeks. With Matt Phillips struggling to make an impact, he was withdrawn on 54 minutes for Ludo Sylvestre, which brought with it a change in shape from a 4-2-1-3 (verging on 4-2-4) to a more rigid 4-3-3. Gary Taylor-Fletcher moved into the forward line and Sylvestre had another opportunity to stake a claim for a starting place. Sylvestre had a strong pre-season, but had to wait until the 1-1 draw with Crystal Palace to make his first appearance of the league season – he got another 15 minutes in the home win over Ipswich but had to watch all of the Cardiff game from the bench. Ludo Sylvestre has a case to be aggrieved at his lack of action thus far, but will his performance at Fratton Park have convinced his manager to start the next match at Coventry? There’s no simple answer unfortunately, despite a largely impressive performance at Fratton Park. Sylvestre is definitely a nice player to watch – he likes to move the ball quickly and simply, almost always retaining possession for his side. His introduction resulted in some neat passing triangles in midfield which had Portsmouth chasing shadows, and looked to help launch attacks. 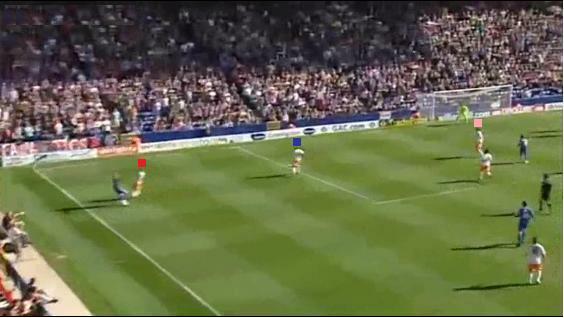 But, and there is a but, adding Sylvestre into the mix created a gap between the midfield and the attack. None of Ferguson, Southern or Sylvestre particularly like to run with the ball and in the final half hour on Saturday, you were just as likely to see the full-backs Baptiste or Crainey supporting a ‘Pool attack as you were one of the midfield three. Individually, Sylvestre absolutely deserves an opportunity to break into the starting 11, but if Ferguson and Southern remain, as is likely, can Sylvestre be accommodated too? Will a midfield of those three players create the chances, the through-balls, the driving runs? I’m not so sure. Since the injury to Elliot Grandin, the final midfield spot has been filled by Gary Taylor-Fletcher who has filled the role with varying success. On Saturday Taylor-Fletcher showed glimpses of how he can be effective at the tip of the midfield three, notably in his through ball for Matt Phillips in the first half and some mazy runs at the Portsmouth defence when other options were non-existent. However he should not be the long-term man for this position and it is up to Holloway to decide if Sylvestre can take on such a role, or if he needs to recruit another player if Elliot Grandin continues to suffer from injury problems. It seems strange to be talking about the defence in the wake of a loss, but on the whole it was another solid performance from a goalkeeper and back four who becoming one of the tightest units in the Championship. The result may tell of a 1-0 win to Portsmouth, but in truth the battle between the ‘Pool defence and Pompey attack was one in which that the visitors had the better. A couple of lapses aside, including the goal on the back of a rare Ian Evatt mistake, ‘Pool don’t currently look like shipping too many goals. What the team might be lacking in attacking conviction, it is making up for in its defensive solidity. Earlier in the season ‘Pool were still looking frail because of their high defensive line, but only three goals against in the last four games suggests Holloway may have been addressing this issue on the training ground. 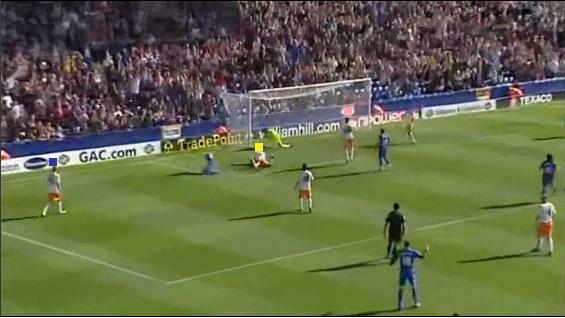 If anywhere, it was set-pieces where the Seasiders looked vulnerable against Portsmouth, long throw-ins especially. A first half throw-in resulted in a free-header for Joel Ward going narrowly wide, and of course the last-gasp winner for the home side came from a similar situation. Despite this, Holloway will be happy to have shed the image from last term as a side that leaks goals. Currently only two sides in the division have conceded fewer goals – Middlesbrough and Derby County. Teams winning promotion are typically built on a sound defensive base, and if Holloway can fine-tune his creative options, the club could be set for a successful season. When ‘Pool failed to take their chances despite dominating long spells of the match, one wonders what thoughts would have been going through Ian Holloway’s mind when he turned to look at his bench. As already discussed, one change he made early in the second half was to bring on Ludo Sylvestre, but who else did he have available? Mark Halstead, Matt Hill, James Hurst and Daniel Bogdanovic were the other options for the manager to turn to – a vast departure from the days when Holloway would often reserve five of his seven substitutes places for attackers. Injury concerns over his two goalkeepers during the week likely forced Holloway’s hand in including Halstead on the bench, and it wasn’t a surprise to see deadline day signing Bogdanovic among the substitutes either. However, the reasoning behind having both Hill and Hurst in the squad is a little baffling. The arrival of young James Hurst at Bloomfield Road appeared an odd decision anyway with so many other right-backs at the club, but Holloway is obviously keen to include him. 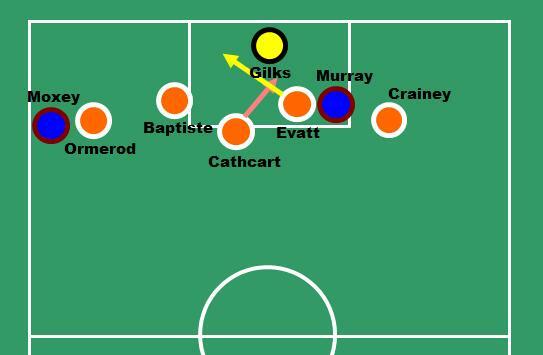 So keen in fact, that Hurst was utilised to fill in as part of the front three, again often from an inverted position on the left instead of his natural right side. As the game wore on, with Blackpool unable to find the goal their performance had merited, ‘Pool had little on the bench to effectively change the game and move up another gear. It is common opinion that the team is lacking an extra attacking option or two, but even without a new signing, it’s surprising that one of Clarke or Ormerod, or even Craig Sutherland or Gerardo Bruna weren’t available to change the game. It’s almost as if the bench had been selected with the intention of going more defensive after taking a lead, as opposed to having something different to find a winning goal if needed. Ian Holloway’s side’s failure to turn that dominance into goals goes some way to explaining why the Tangerines’ nascent attempt to bounce back into the Premier League at the first attempt has been solid rather than spectacular. 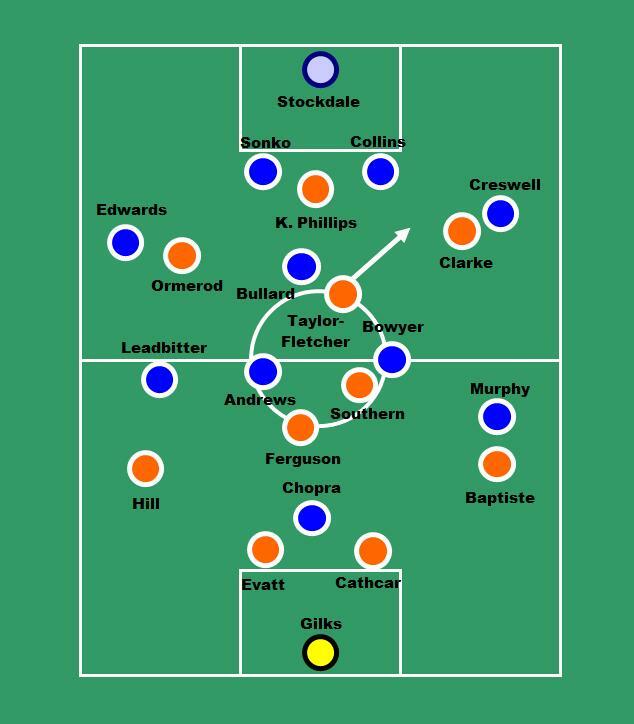 At the start of the season, in association with the good folk over at Experimental 3-6-1, I introduced Blackpool’s 2011/12 Season Visualiser. The premise was that each game would be colour coded by difficulty – red for most difficult fixtures, green for theoretically easiest games and varying colours of yellow for those in between – based on an algorithm largely calculated on the back of bookmakers’ odds. So how does the visualiser stack up against real life so far? 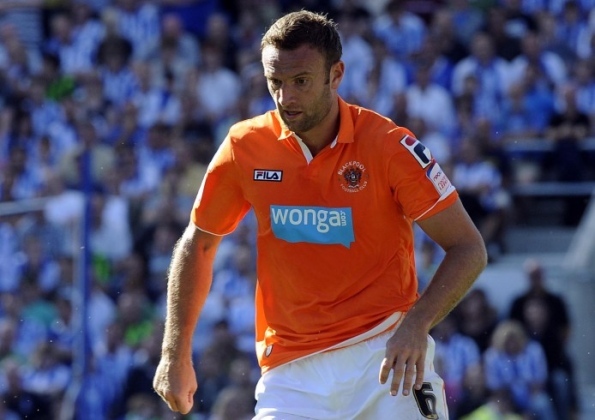 Let’s look at the August results and see how the season looks like panning out for Blackpool. For the actual results, wins are coloured green, draws yellow, and defeats red. According to the visualiser, August had the second easiest set of fixtures for the entire season, despite featuring three away games. Brighton was identified as the toughest game of the month, but all of the other matches gave a good opportunity to score points. In reality, there was one real anomaly which was the home defeat to Derby – a fixture Blackpool were expected to win. It was a game that Blackpool could have won on another day, as over the course they didn’t play too badly, but simply failed to create enough goalscoring chances – in contrast Derby took their one golden opportunity. Elsewhere there were no other major swings from the visualiser’s prediction to the actual outcome, although the away win at Hull on the opening day can be counted as a particularly good result. ‘Pool were able to salvage a point from the hardest game in August – the long trip to Brighton – which was an above par outcome with the visualiser signalling a home win if anything. Another part of the original post was to devise points targets at the end of each calendar month. These targets were based on traditional averages for attaining survival, the play-offs or automatic promotion, but weighted depending on the difficulty of the fixtures. The below table keeps track of how Blackpool are faring so far. Points targets for three end-of-season scenarios, weighted by difficulty of fixtures. ‘Pool on course for upper mid-table finish. As things stand, ‘Pool are a little behind the targets to achieve promotion, be it automatically or through the play-offs. This probably reflects the feelings of most Blackpool fans at the moment, in that the squad seems solid enough, but appears to be missing that edge which would take the team to the next level and in contention for an immediate return to the Premier League. Sadly the activity on deadline day was a little underwhelming, and the club may now be reliant on the loan market to complement the current squad. Looking ahead to September, the international break means we have just four league games during the month, including one Tuesday night match. In order to catch up with the play-offs points target, a wholly achievable aim, ‘Pool should seek to take a minimum of seven points from these matches – two wins, a draw and a loss. The graphic below illustrates the difficulty of the fixtures as calculated by the season visualiser. Home games against Ipswich and Cardiff, followed by trips to Portsmouth and Coventry await Blackpool in September. The visualiser suggests the games in September get easier as the month goes on, despite the first two being at home and the latter two away. It’s hard to completely agree with this, but obviously in the bookies’ eyes at the start of the season, Ipswich and Cardiff were more heavily fancied than Portsmouth or Coventry. Certainly the trip to the Ricoh Arena should be pinpointed as one of the best opportunities all season to pick up an away win given the Sky Blues’ troubles, but each of the other three matches throw up their own difficulties. Heavy investment at Portman Road looked to finally be paying off when Paul Jewell’s side won 3-0 at Bristol City on the opening day, but since then it’s been a little more turbulent, including the 7-1 humbling at the hands of Peterborough. Ipswich did recover from that mauling however and won their last game 2-1 against Leeds. Cardiff remain one of the better sides in the Championship despite losing key players from last season, while Portsmouth’s continuing strategy of a slender squad comprising of a small number of well-paid players makes them a dangerous team, especially at Fratton Park. It’s clear that September offers a much sterner challenge than August did, and the results in the next four games will shed more light on how Blackpool are shaping up in 2011/12. There will still be nothing conclusive when October rolls around, but we’ll be nearer to judging whether Ian Holloway’s side can realistically hope to bounce back to the top flight at the first attempt.